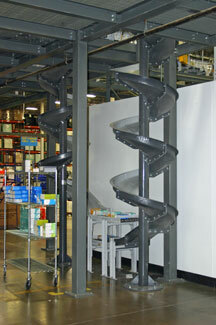 Virtually anything you can convey on a gravity, power, or belt line can be moved on a chute system. Specially designed fiberglass module profiles help control the descending speed of your products. In high humidity situations, the self starting characteristics of the gel-coated fiberglass assists products to flow freely, gently and safely. 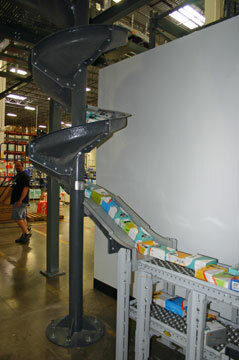 The spiral chute provides at least three times the floor space savings over conventional decline conveyors. 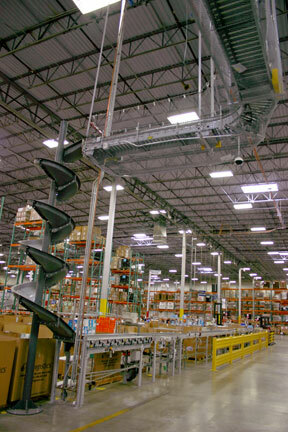 Greater space savings can be realized by multi-floor applications. 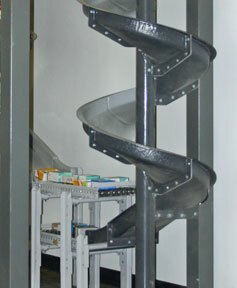 The size of the chute allows it to be used in tight situations, such as elevator shafts and other small spaces. 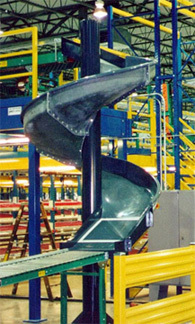 In a distribution environment, this chute system declines from a sort mezzanine into a consolidation conveyor/ball transfer station. 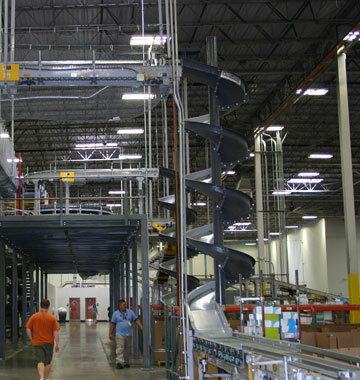 Chutes feed floor level conveyors from suspended overhead live roller conveyor system.